Waste water is the water which we used for domestic or industrial needs with some contaminants changed its initial chemical composition or physicial characteristics. Special category of contamination is a biological contamination: different microorganisms, incl. pathogenic ones. These contaminants come to the sewage system with human physiological discharge, with water from bathrooms an kitchens. Distinguishing feature of domestic waste water is its rather constant composition. As a rule, for domestic waste water treatment we use biological methods. 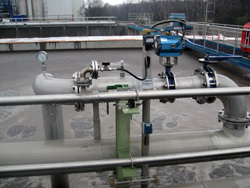 Industrial waste water is the water used in technological processes and unsuitable for second usage. Industrial waste water composition is various and it depends on production type and necessary technological process. Industrial waste water contains organic and innorganic admixtures or its mixture, toxic compounds, valuable substances, specific types of microorganisms used in the industry. Variety of composition and specification of contaminants is the reason to use as chemical/ physicochemical and biological methods of treament.